McDonald’s Corp. (MCD), the world’s largest restaurant operator, will begin listing calorie counts on menus in the U.K. starting this week, part of a government initiative to tackle the health risks associated with obesity. “People will now be able to see at a glance how many calories are in their burger, salad, Happy Meal or milkshake,” the U.K.’s Department of Health said in a statement today. The calorie counts will start appearing Sept. 7, it said. Oak Brook, Illinois-based McDonald’s, which has about 1,200 stores in the U.K., has been trying to lure more health- conscious customers with fruit smoothies and oatmeal. Starbucks Corp. (SBUX) and Burger King Holdings Inc. also signed the government’s labeling pledge, which requires restaurants to list calorie content for food and non-alcoholic drinks. In July, McDonald’s said it would start putting apple slices and smaller packets of fries in all of its Happy Meals in the U.S. this year. The change reduces calories in kids’ meals by 20 percent, the company said. 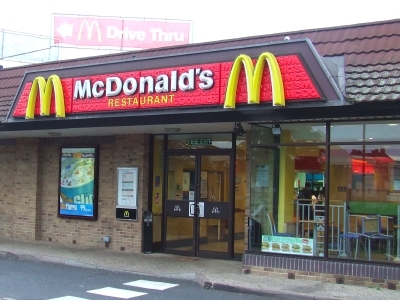 McDonald’s, which generates about 60 percent of its revenue outside the U.S., has almost 33,000 stores worldwide.